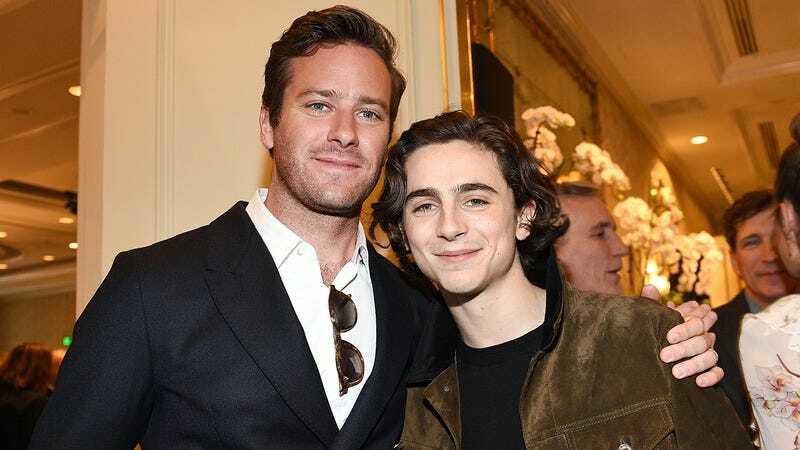 Okay, if you became obsessed with the movie Call Me By Your Name and its two stars like we have, this bit of behind-the-scenes trivia is going to absolutely blow your mind: Before they worked together on the movie, Timothée Chalamet and Armie Hammer both lived in fear of the same witch! Looks like Hollywood is a small world after all! While they’d never met prior to filming Call Me By Your Name, Chalamet and Hammer immediately bonded over their personal connection to Gruvborda, the ageless hag who’d been haunting their every waking moment since their first days in the movie business, perhaps even since they were born. At their first rehearsal, the two actors, though having grown up on opposite coasts, realized they had both gone about their day-to-day existences consumed by the perpetual terror that Gruvborda would cast an irreversible hex that covered their face in boils or trapped their father’s soul inside a rusty pocket watch with its time set to run backwards. What a wild coincidence, and one that might just explain the undeniable chemistry those two shared on camera! In fact, along with spending their childhood nights placing chicken bones and burnt wormwood around their homes to ward off Gruvborda, Chalamet and Hammer also chummed it up on set over how they’d both made the mistake of not turning away when Gruvborda lifted her eye patch and showed them how their own deaths would play out in the foggy, bottomless socket where her eye was supposed to be. Truly, the stars aligned for Call Me By Your Name’s casting department to nab two actors who both just happened to have mothers who fell into catatonic states after Gruvborda fed their voodoo dolls to a pig to independently punish the young actors for hubris. Welp, we’re swooning all over again. Could these two get any more perfect?! This is the icing on the cake for how special Call Me By Your Name is. The fact that the same witch ate Timothée Chalamet’s and Armie Hammer’s infant brothers is giving cinephiles like us an entirely new appreciation for the film. Just another reason we’re rooting for this movie to take home the big prize at this year’s Oscars! Good luck, Timothée and Armie!